One toe over the line, sweet Jesus, and that's a potential citation. Four InterContinental Hotel guests enjoying some wine and mixed drinks one August night decided to stroll the hotel's grounds along Fort Point Channel. 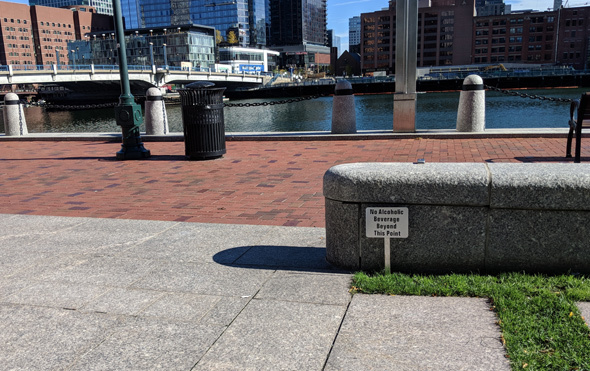 But then they went too far - they walked from the hotel's granite walkways onto the bricks of the Harborwalk just as two BPD detectives were arriving for a snap inspection. Read more. In a letter to the state, the BPDA says it's resolved its long-standing issues with Don Chiofaro and the city is now OK with him replacing the Aquarium garage with a 600-foot tower (yes, just one), as part of a waterfront master plan that would also see new open space at what is now a Long Wharf parking lot and a new deck for the Harborwalk near the Moakley Bridge. Read more. We're a high-rise building. I don't think we’re a farming community. 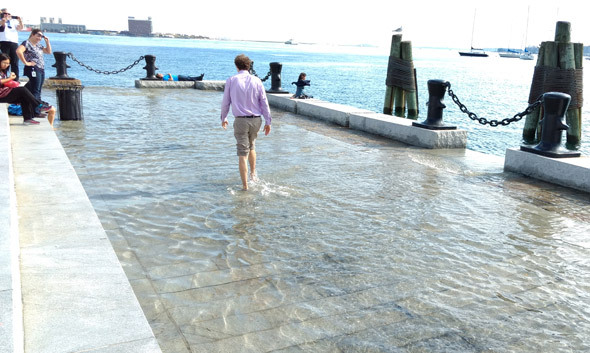 Our own SwirlyGrrl took a walk down to the end of Long Wharf today to see the effects of the "king tide," a high tide two feet higher than normal caused by the alignment of the sun and moon - but which experts say will become the normal tide by 2050 as the polar ice sheets continue to melt and sea temperatures rise. R. also went down, shows us there's even flooding beyond the Chart House: Read more. The Globe reports Don Chifaro finally realizes he's just never going to get to replace the Aquarium garage with one of the tallest buildings in the city and so will file plans for something a bit less grand, but more in line with BRA recommendations. NorthEndWaterfront.com informs us about the return of the Battle of the Barges fireworks display on Sept. 3, over the harbor. You know those things that look like giant laptops down by Harbor Towers? UPDATE, 2 p.m.: The stickers are already gone. Nate Swain, the artist who gave us the Lego wall, gives voice to that feeling everybody has when they walk past those sculpture things by the water. Just because we don't have any snow doesn't mean you can't still take magical seasonal photos, as Renee shows us. The Globe reports Don Chiofaro thinks the city should help him out with his proposal to replace the Aquarium garage with a big complex because it won't let him build it quite as big as he wants. The Boston Business Journal reports Massport will use some land it bought from the MBTA between E. 1 Street and the Reserved Channel for a "freight corridor" that should take trucks off E. 1 and to build a 4.5-acre park. 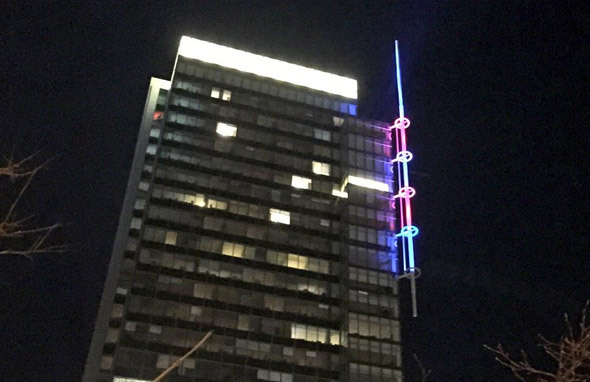 TruNE_79 is loving how Atlantic Wharf is pumping out the Patriots colors in advance of tomorrow's game. The Globe reports the owner of the high-end clothing store is throwing in the towel because the owner of its Northern Avenue land wants the space for development and she decided to retire, rather than sign a long-term lease to move into a building next door. Boston Restaurant Talk reports that Sam's, the restaurant inside the clothing store, however, will remain open. Outside James Hook on the waterfront. But the burgeoning mini-city now erupting in the Seaport area has plenty of room for caffeination. The Boston Licensing Board decides tomorrow whether to let a Dunkin' Donuts franchisee open a new Dunkin' Donuts at 405-409 D St., as part of a new residential development. To be fair, not many new developments look good until the cranes go home. But after you’ve made all the allowances you can, you’re still stuck with the fact that the Innovation District is a serious failure of urban design. When you're mayor, you get to play with the best toys. Photo by the mayor's office. Work officially began yesterday on the $600-million One Seaport Square project off Northern Avenue in South Boston, which will feature more than 800 residential units in two 22-story buildings, a luxury movie theater, a luxury bowling alley and a luxury health club, as well as space for additional luxury shops and restaurants. 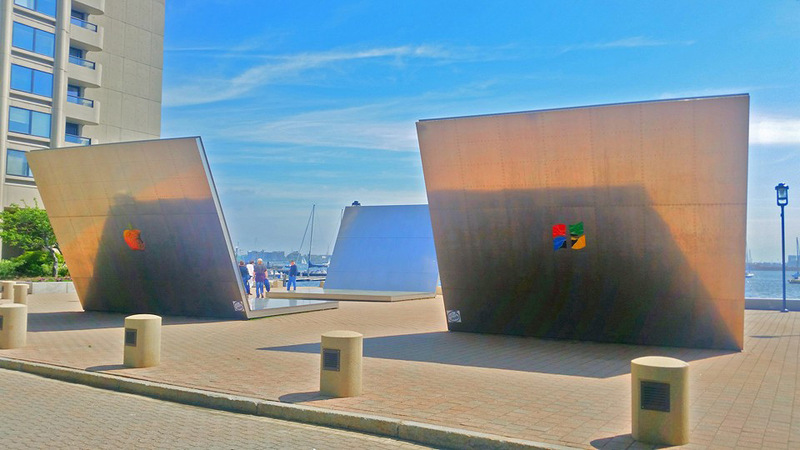 Rename Christopher Columbus Park after Tom Menino? There's a petition for that. A ten-screen complex being planned for Seaport Square across from Fan Pier will feature reserved seating in custom recliners for moviegoers who will be able to sup on small plates and sip from their wine or beer. Kerasotes Showplace Theatres has begun work on its proposed Showplace Icon for a building in front of one of the current Vertex buildings. The company highlighted its proposal this morning in hearing before the Boston Licensing Board - which decides whether to let it buy the liquor license now held by the Bar Room on Broad Street. The Globe reports the family owners of James Hook & Co. are looking to replace their current seaside digs on Atlantic Avenue with a 22-story residential tower - and space for them to keep selling lobsters and other seafood in a new restaurant. The Herald reports on parking concerns from the Municipal Harbor Plan Advisory Committee.